« What is it? A patch box! What is it? It’s a Civil War Congressional Medal of Honor! 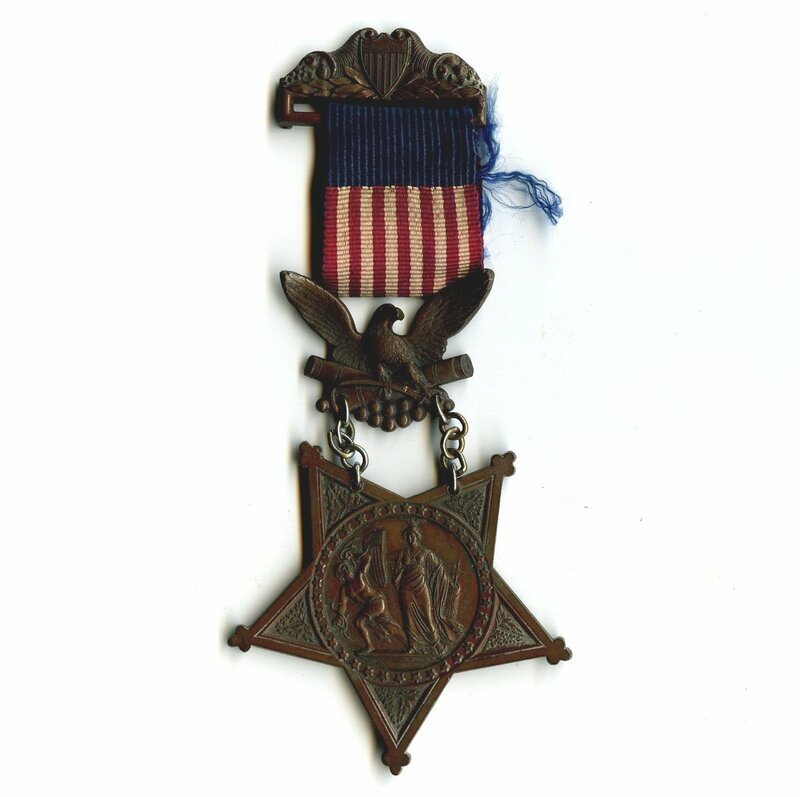 This particular medal belonged to Joseph Albie Sewall (1839-1922) of York who served as a private in Company G, 27th Maine. Contracted to a 9-month campaign, the 25th Maine was first asked to stay behind to defend Washington, D.C. in June, 1863, due to the invasion of Pennsylvania by Robert E. Lee (the Gettysburg Campaign). They declined. The 27th Maine was then asked to help and 300 men agreed to stay behind. Initially, these soldiers were told that “Medals of Honor would be given to that portion of the regiment that volunteered to remain.” The battle was soon over and they left Washington for home on July 4th, reuniting with the rest of the regiment in Portland for their mustering out on July 17th. Later there was a disagreement as to which of the men actually served since records had not been kept. Commanding officer Lieutenant Colonel Mark F. Wentworth, who had witnessed great sacrifice and valor in the battlefields, did not believe that the soldiers of the 27th deserved the medals. 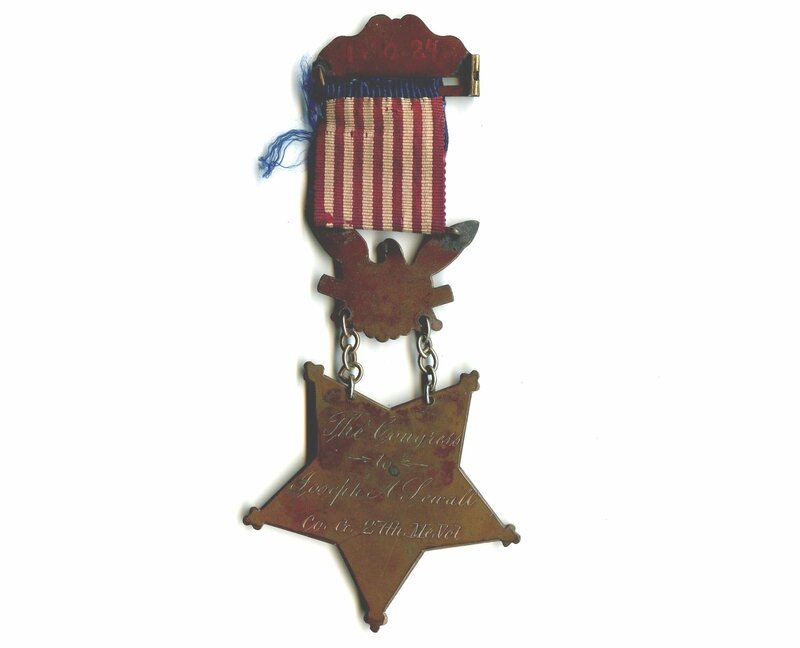 A few of the medals were distributed unofficially, but were purged by congress in 1917. This medal was given to the Museums of Old York by Joseph’s granddaughter, Anne Elizabeth (Sewall) Bowden in 1970. There were a total of 949 men listed on the muster rolls for the 27th Maine. During their service, the regiment lost nineteen men by disease and one was killed by the accidental discharge of his musket. The medal is also known as “Minerva Repulsing Discord”. Taken in the context of the Civil War soldiers and sailors struggling to overcome the discord of the states and preserve the Union, the design was as fitting as it was symbolic. The medal depicts Minerva, the Roman virgin goddess of wisdom, fighting Discord, the Roman goddess of strife. Wasn’t there a York county regiment that was awarded the Medal of Honor for reenlisting after their service time was up? Great answers from Kevin Freeman on Facebook and ebharlowe on the blog! What is it? It’s a seam rubber!